This new Muhammad film does not emerge out of thin air. In addition to earlier movies (like Akkad’s The Message) and others still in the making (by Qatar), Majidi’s large-scale project is part of an effort to visually reclaim the Prophet and his legacy in Iran that has been under way since the Danish cartoons of 2005. While reactions to the cartoons in some Arab, Sunni and especially Salafi quarters included issuing of decrees stipulating that “images of prophets are disrespectful and caricatures of them blasphemous,” a vastly different response has unfolded within Iran over the past decade. 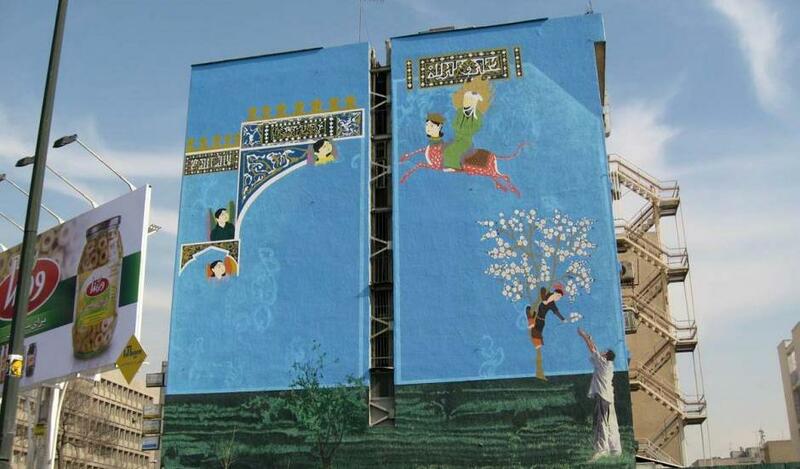 Indeed, Iran has launched a number of artistic, educational and public relations projects since 2006, itself dubbed by Ayatollah Khamenei “The Year of the Noble Prophet.” As a result, celebratory depictions of the Prophet have emerged in full force, with Majidi’s film the latest outcome of these officially sanctioned endeavors. The story of Muhammad’s youthful “seal of prophecy” recognition is a popular one across Islamic lands even today. Over the course of the 20th century, a number of mass-produced images of the young Muhammad—composed in a wide array of creative variants—were made in Iran. These appeared in banners, posters (Figure 5), postcards, carpets and stickers until they were banned in 2008. While the recent Iranian prohibition of these images is certainly a response to the Danish cartoon controversy, it also emanates from the discovery of its original pictorial source: an early 20th-century Orientalist photograph of a young Arab boy. Along with the anxieties brought about by this borrowed image, “severe security” concerns in the immediate aftermath of the attack onCharlie Hebdo caused the Victoria and Albert Museum to attempt to dissimulate its possession of one of these modern Iranian images of the young Muhammad.